This month I was delighted to be awarded artist of the month by Artist’s for Conservation. The Canadian based organisation, represents 500 artists from 30 countries in the nature/wildlife genre, who are committed to conservation. The award is given to a member of the group who has demonstrated a combination of artistic excellence and an outstanding contribution to the conservation cause. Click her to read the orphans' story. ​Along with the painting above, I have also donated this little portrait of 'Savas' to the auction; an anti poaching dog trained by 'Animals Saving Animals', who has recently been deployed to help Rhino Conservation Botswana. I was delighted to be invited to join Artist's for Conservation at the beginning of this year. They are a Canadian based international non-profit organisation, which represents 500 wildlife artists from 30 countries who are committed to conservation. The 'Silent Skies' is an international collaborative super-mural featuring all 678 endangered species of birds of the world. The 100ft installation; made up of 8in square canvasses, will form the artistic centre piece of the 27th International Ornithological Congress in August 2018 at the Vancover Convention Centre, after which the mural will tour internationally. I have produced two originals for the mural featuring a Nias Hill Myna and a Straw-Headed Bulbul. I have painted this portrait of 'King' a little lion cub who was kept illegally as a pet. All of the money from the sale of the painting will be donated to Born Free who are looking to re-home him at their big cat sanctuary in South Africa. I have donated two pieces to this year's Spring Auction at Wildlife SOS. They are a charity in India who rescues and rehabilitates wildlife in distress. They specifically address the problem of injured and sick elephants that are forced to work in the slums and crowded cities; taking action to remove abused elephants and retire them to their sanctuary. 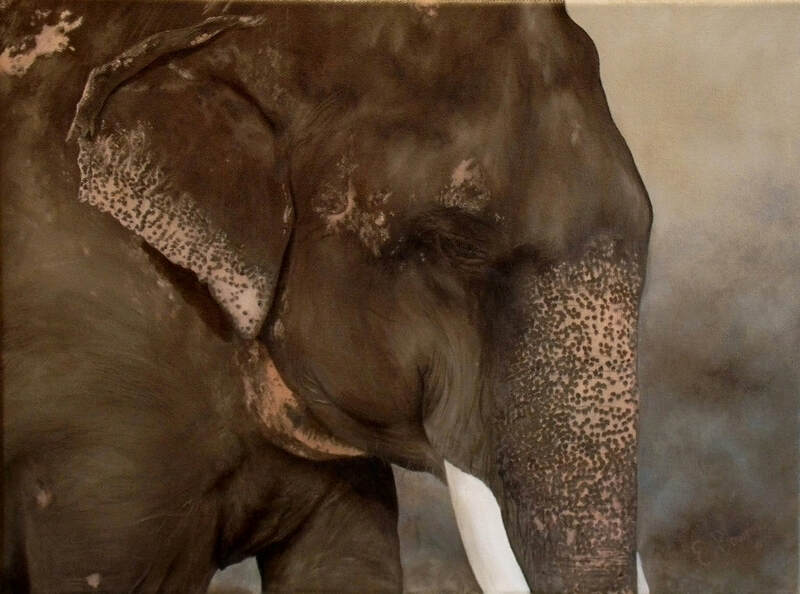 The two pieces are an Artist's proof of ‘Matt – The Long Ranger’, a painting I did to raise funds for Save the Elephants, and a pencil sketch of ‘Laxmi’; one of the elephants at the sanctuary. Laxmi was a begging elephant rescued by Wildlife SOS in 2013. She was severely obese, having survived on fried street food given to her by tourists. Even though her health is now improving, she is known affectionately among supporters of the charity as ‘Our Little Dumpling’. I have donated this little Mountain Gorilla painting to the ‘Remembering Great Apes’ kickstarter campaign. Photographer, Margot Raggett’s mission is to raise awareness of the threats facing various wildlife species and funds to protect them, through the sale of beautiful books, full of images donated by many of the world’s top wildlife photographers. Her first two books, Remembering Elephants and Remembering Rhinos were both funded through Kickstarter campaigns, and have gone on to raise hundreds of thousands of pounds. 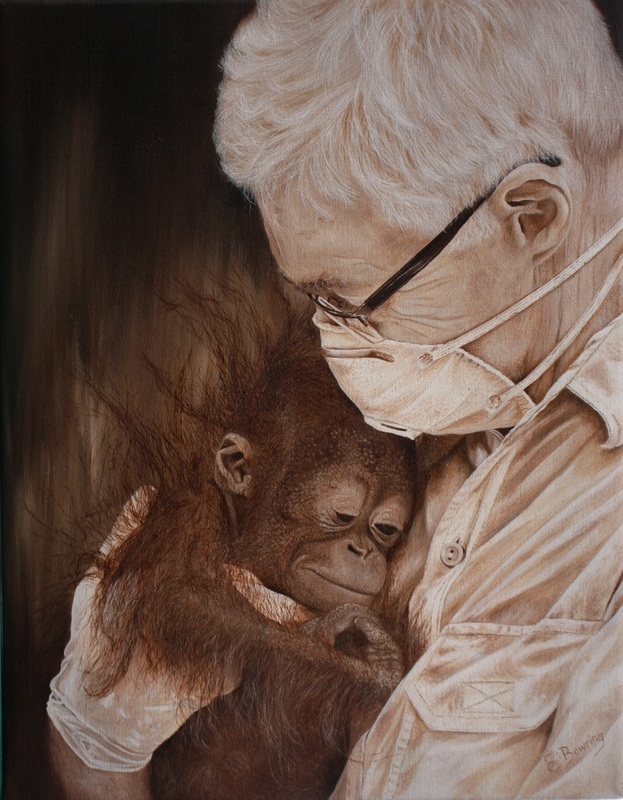 The latest book ‘Remembering Great Apes’ is being funded in the same way, and I was delighted to be able to help by donating my painting ‘More Precious than Gold’ . 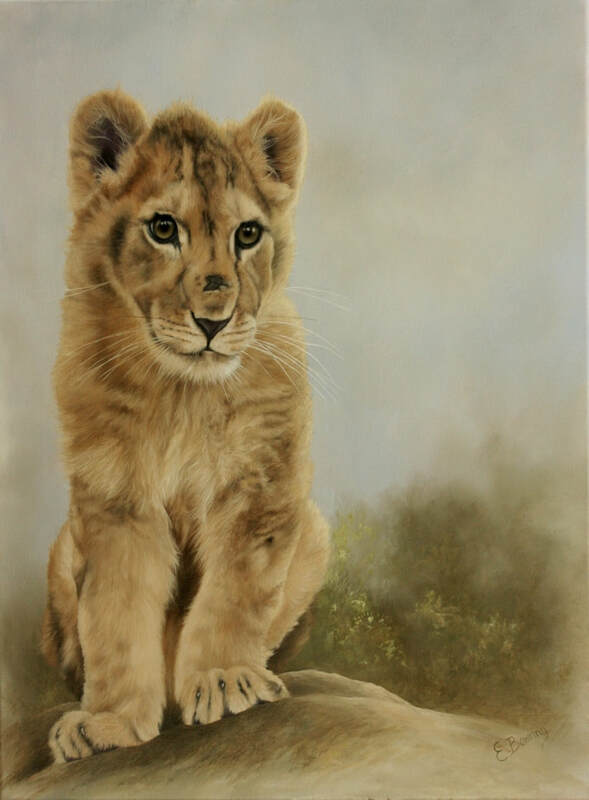 I have donated this little lion cub oil painting to the Born Free Foundation. The painting will be auctioned at their Gala event at the Royal Horticultural Halls in London on 30th November. The painting was named 'George' by Virginia McKenna; founder of Born Free Foundation, after the great conservationist George Adamson. Born free was founded in 1984 originally as ‘Zoo Check’, and in 2017 they have gone back to their roots; with a focus on their work to challenge the exploitation of wild animals in captivity. They are ending the year with the ‘Beyond the Bars’ gala in London. The evening also marks the republication of Born Free’s first book ‘Beyond the Bars’ – originally released 30 years ago and featuring contributions by leading conservationists and campaigners of the time. Update - 'George' sold at the auction and raised £3,000 for Born Free. I have donated this oil sketch to 'Explorers Against Extinction'. This is a unique event highlighting the threat of extinction to some of Africa's most iconic species. The event will be held at the Royal Geographical Society, London in October, but there is an online auction for mine and many other donated artworks and celebrity sketches. All of the profits from the event and auction, will go to The David Sheldrick Wildlife Trust and Animals Saving Animals. My sketch is of 'Gawa' who is a wild born elephant, whose mother; 'Galana' was raised from an orphan by the DSWT and is now living a fully independent, wild life. Update - The painting sold at the evening, raising £1,500 for Cheetah Conservation Fund UK. I am donating an auction prize of a pet portrait commission at this year's Battersea Dog's and Cat's Home 'Collars and Coats' Ball. 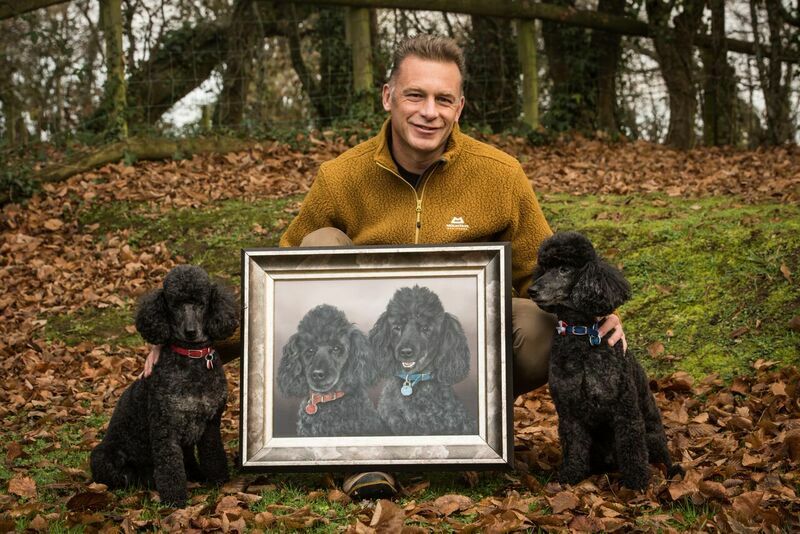 I've painted Chris Packham's poodles - Itchy and Scratchy for him, and this portrait will be on show at the event; so that people can see the sort of portrait they could commission if they place the winning bid. Update - The winning bid was £950, which will all be donated to Battersea Dog's and Cat's Home. Whilst filming his latest series of 'Animal Orphans', Radio and TV presenter, Paul O'Grady, visited Sepilok Rehabilitation Centre in Borneo. He described the experience of meeting the orphaned orang-utans there as 'heart wrenching' and fell in love with one orphan in particular 'Archie'. 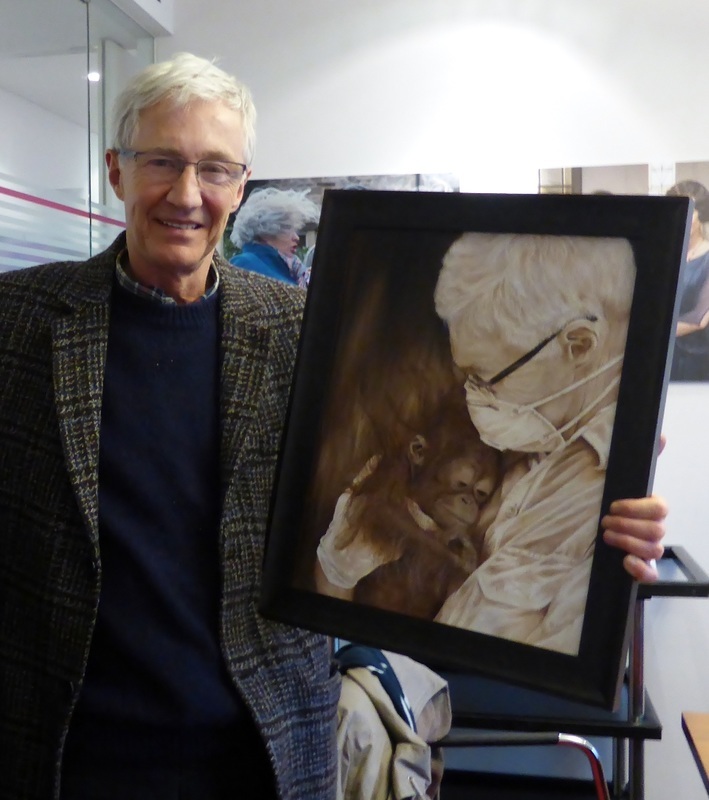 I painted this portrait for Paul; capturing the moment he held Archie and it was presented to him as a thank you for his support for Orangutan Appeal UK. My original oil painting of 'Doris' the Bengal Slow Loris will be sold to raise funds for 'The Little Fireface project'.